Johnny Came Home is my superhero sci-fi novel set in the town of Midwich, West Virginia. Noting that microbes-to-man evolution is the the preferred explanation for comic book super powers these days, I basically set out to see if superheroes could be explained from a Biblical creationist POV. Editing this Biblically faithful superhero novel took much longer than I originally thought! I had no idea how many typos and grammar errors can creep into a document when you’re not looking! As much as I hate to admit it, as I began editing Johnny, I noticed a few plot holes. Plot holes are one of my personal pet peeves. I cannot count the times that I’ve been thoroughly engrossed in a book, quite enjoying myself only to encounter a contradiction so glaringly evident that it takes me out of the fantasy and basically ruins the book. While the worlds we create as authors are imaginary, these imaginary worlds have boundaries and rules which cannot be violated if we’re to be faithful to our readers. Even historical fiction is really an imaginary world where we flesh out the details and dialogue of real events, for we don’t really know the details and dialogue we’ve just added really occurred. In fact, we can only say that our story is one possible way these events might have played out. If you create a scenario which defies the rules of your imaginary world, or a ridiculously fortuitous deus ex machina [whereby a seemingly unsolvable problem is suddenly and abruptly solved with the contrived and unexpected intervention of some new event, character, ability, or object], or a credibility-sucking plot hole, you’ve violated your readers investment in that world. The problem for the evolutionary fiction we teach our kids is that it contains a few crimes against fiction, things that frankly destroyed it credibility when I stumbled upon them. Keep in mind that we’re answering the question, “What IF the world came to be by all-natural processes consistent with those we observe today?” Yet right from the beginning of the story, we have a deus ex machina whereby either everything came from nothing [not something we observe happening today] or as a property of the multiverse [which is unobservable and theoretical]. So the question has really been adjusted to “What If the world came to be by some miraculous event or by some unobservable multiverse straight out of a science fiction novel, but then developed by all-natural processes consistent with those we observe today?” Again, we have a problem – several in fact! The evolutionary science fiction tale requires other things we never observe, special one-time events that are quite simply miracles: they propose information without an intelligent source [though our experience teaches us that such information is always the product of intelligence], life from non-life, [when no one has ever observed any such thing] and the gradual development of one kind of organism into another [viz. fish to amphibians, dinosaurs to birds, ape-like ancestors to humans]. None of these things have ever been observed. There is no present process that can account for them. They require deus ex machina to move the plot along. Rather than admitting that the evidence doesn’t affirm microbes-to-man evolution, he came up with punctuated equilibrium, the idea that organisms speciate, adapt and mutate as we observe today [facts which Creationists likewise affirm], but then undergo rapid [geologically speaking] evolution periodically which causes one type of creature to change into a completely kind of organism; conveniently, these changes occur in the gaps in the fossil record, so that he’s extrapolating from the lack of evidence for Darwin’s predicted transitional forms rather than evidence supporting his theory! This is a major plot hole in the evolutionary science fiction tale we are taught in public schools! Neither is the only plot hole in the all-natural just-so story of the cosmos. Co-evolution is proposed to explain the contradiction that bees [and other pollinators] need pollen to survive and flowers need vectors [pollinators] to survive. Homology is touted as evidence for common descent, except when they know that the organisms did not share a common ancestor, in which case homology is evidence of convergent evolution. When an organism ceases to leave fossils in the geological record, this is said to be evidence of its extinction, yet “living fossils” like the Coelecanth anf the Wolemi pine are admitted to leave absolutely no fossil traces over alleged millions of years despite their living existence in the present. Polystrate fossils, extending over several strata which would normally be interpreted as several long ages, are admitted as evidence of geologically quick, catastrophic processes, yet such layers elsewhere sans polystrates are unquestionably regarded as evidence of long ages. And so on and so forth. Being so painfully aware of the problems with the all-natural story of the cosmos, you can probably appreciate how I would want to rid my own fictional work of plot holes and other crimes against fiction. And so I did. Johnny Came Home deals with the flaws of evolution, the superior interpretation of Biblical Creation and the evils of racism, wrapped in an action-packed superhero epic full of surprises, humor, mech suits, flying saucers, hover crafts, zombies, clones and epic battles – all from a Biblical worldview! If you’re interested in finding out more, visit http://TonyBreedenBooks.com or visit our Facebook Page at http://facebook.com/tonybreedenbooks. 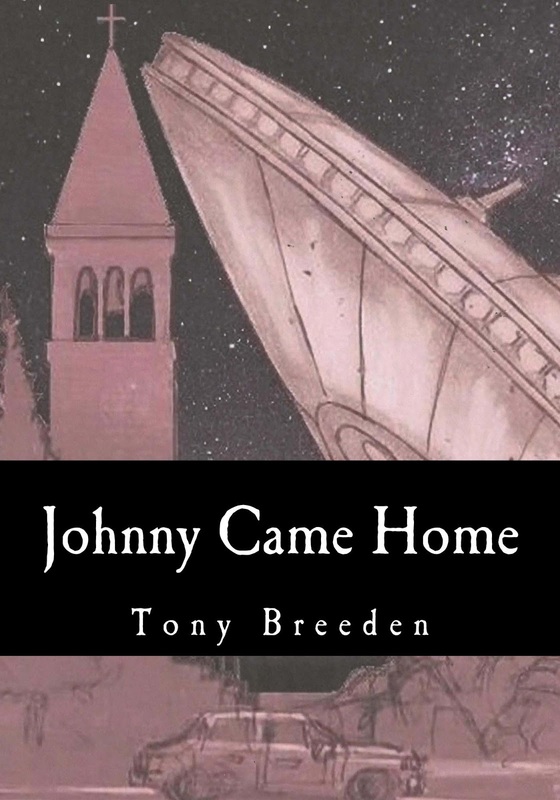 If you share this on Twitter @creationletter don’t forget to include the hashtag #tonybreedenbooks!